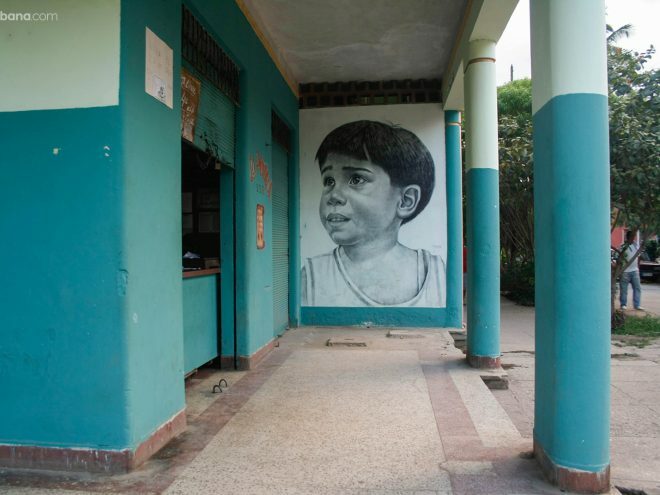 Some distance after you cross the Almendares River and just before you leave Playa municipality, in that part of Playa that most people think is Marianao, you can see a series of portraits of children painted on some high walls that belong to nobody in particular. The residents of the area have been impressed by them, and I include myself among them. These faces of girls and boys seemed to appear overnight. Painted in a monochromatic scheme of black and white, they are gigantic, colossal images occupying space on old walls which have lost their original colors. For a while now these walls have been discolored. Grey on grey: not that old hackneyed white on white which is more aged and decadent than those greying walls. Pure and simple life, not a single drop of color, no over-the-top shininess…just that. It is a pure life that surges from the eyes of those humble children, smiling shyly. It surprises the unsuspecting passers-by and erases the emptiness of those walls. Grey on grey. Grey which, for once, illuminates. When I talked to the residents of the area they gave me the exact indications for where each portrait is located. They tell me that the macabre myth going around that they have been inspired by children who suffered traffic accidents isn’t true. In fact, I am given the precise addresses of the children who appear on the walls. There is one more detail they tell me about, something I wouldn’t even have imagined. These portraits have been retouched! From time to time, some of them have become damaged; the paint has been scraped off here and there. And then they reappear perfectly new as if nothing had ever happened to them. In other words, behind these portraits, there is an artist who is like no other. Not only does he paint and propose new works, he also determinedly looks after the task of maintenance, of looking after what has been painted, of sustaining the light with which he gave new life to these walls and to the neighborhood. As I look around at any street or street corner in this city, the gesture (or rather the exploit) of Máisel López, the creator of these portraits, seems to be a cry, an alarm or an urgent call for the beauty that is so lacking in our lives.